Save Ghana’s sovereignty and our food supply! As the world celebrates the World Food Day, today, Wednesday, 15th October, 2014, we call on our Parliamentarians to ponder seriously on a major threat facing Ghanaians, our environment, our health, biodiversity, national security, and our sovereignty as a people. This threat is the Plant Breeders Bill, smuggled to Parliament by unseen hands and particularly, the International Union for the Protection of New Varieties of Plants, known by its French acronym, (Union internationale pour la protection des obtentions végétales) as UPOV. If Ghana passes the Plant Breeders Bill it gives away control of its agriculture, and gives away its control of its own food supply for nothing but empty promises. The Plant Breeders Bill makes a gift of Ghana’s land and agriculture to the Agribusiness TNCs. 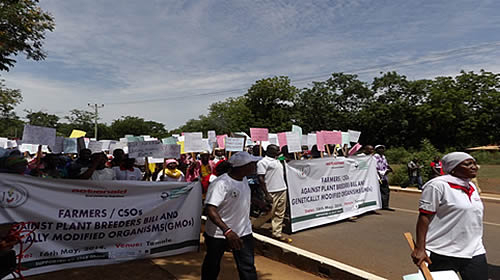 With this law, the TNCs can flood Ghana with GMOs and demand Ghana pay the price they set. Many of Ghana’s politicians and scientists think the PBB will bring investment. All investment it brings will be extractive investment, growing huge monocultures of pesticide-saturated crops for export. Any new seeds developed by Ghanaian scientists will ultimately be owned by the Agribusiness TNCs who have the money, and power under the PBB, to acquire whatever they want, and take the profits out of Ghana. The Plant Breeders Bill does not consider the rights of indigenous farmers. Indeed whilst it puts the rights of the corporate plant breeder above the laws of Ghana, the rights of the Ghanaian farmer are placed under the discretion of the Minister of Agriculture. The PBB makes it a criminal offence for a farmer to sell, market and or propagate any seed that even through open seed propagation can be found on his farm without authorisation of the breeder. Already Monsanto, along with Syngenta, Dupont, and other Agribusiness TNCs are buying up African seed companies (theecologist.org/News/news_round_up/2592946/big_biotechs_african_seed_takeover.html). Most of the local and regional African seed companies were created by farmers to market seeds developed locally in African countries. The TNCs will claim IPRs for these seeds, pirating their DNA and claiming it as their creation, stealing decades and centuries of work by African farmers in order extract the profits from African countries. Then they will sell the seeds back to the farmers, charging whatever price they wish. The Plant Breeders Bill permits and encourages Agribusiness TNCs to pirate Ghana’s seeds in this same way, forcing Ghanaians to buy them back. This is why Ghana’s farmers and scientists can never profit from this bill. The Agribusiness TNCs will own and claim all rights to the farmers’ seeds. “Purveyors of transgenic products claim that GM farming boosts yields and farming incomes by saving on fossil fuels, pesticides, and labor. Another claim arising from this assumption is that GM farming represents a step toward environmental sustainability by decreasing emissions and the use of agricultural chemicals. GM advocates also maintain that these products pose no health risks to either the farmers or consumers. None of these arguments have held up over extended periods of use or in the face of independent testing. Pesticide and herbicide-resistant crops (by far the most widely used GM varieties) actually lead to an increase in pesticide and herbicide use over time horizons of as little as four years. Financial gains, which farmers make through increased yields, are offset by increased spending on patented seeds, fertilizer, and herbicides or pesticides, leading to a net decrease in income for all but the largest mega-farms. These higher input costs are especially damaging when small, more marginal farmers experience crop failure. Elevated levels of bankruptcy and consolidation have frequently occurred following the deployment of GM crops. Let Ghana govern Ghana! 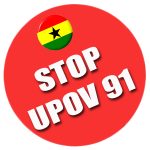 Save Ghana’s sovereignty and our food supply! Defeat the Plant Breeders Bill!